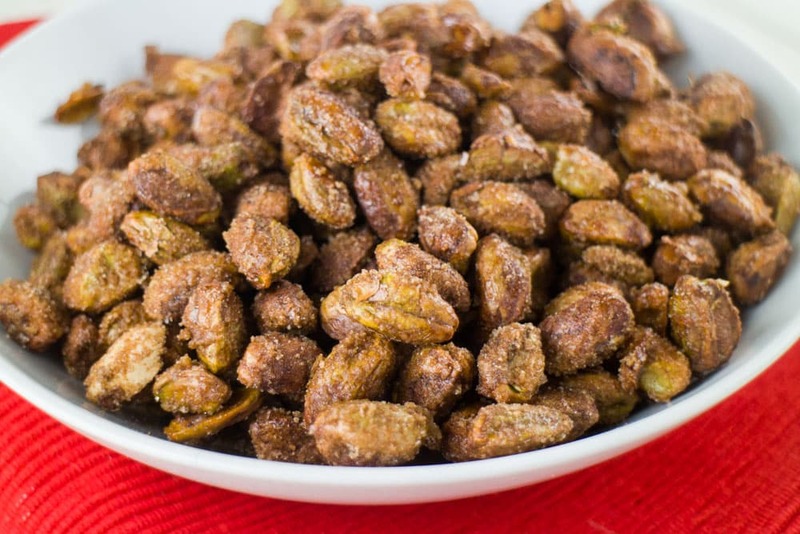 These Cinnamon Sugar pistachios are perfect for family or solo snacking, but they’re also perfect for having a dish filled when friends and family stop by over for the holidays. They’re great for a holiday present if you want to mix up the usual tins of cookies that you make. 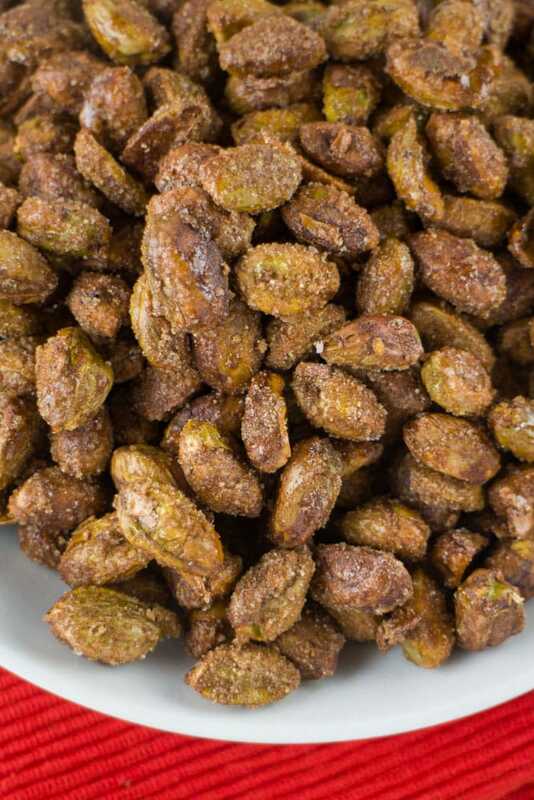 Trust me, everyone will love these sweet pistachios! The scent of cinnamon takes me back to baking snowball cookies with my Mom as a kid. Every December we’d set a weekend aside to roll out cookie dough on the kitchen table. A fun fact is that the rolling pin that we used to bake cookies with as a little girl now resides in my own kitchen. Whenever I take the rolling pin out of the cabinet I immediately think of cookies! 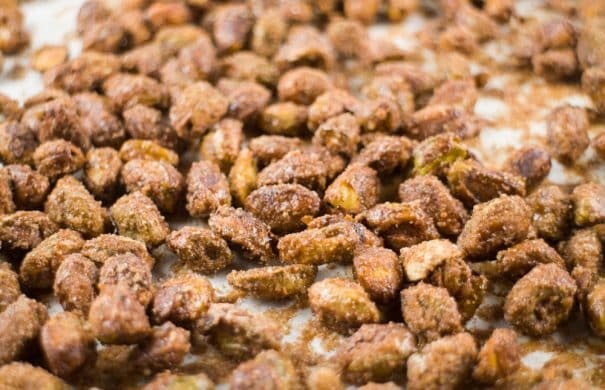 We won’t be rolling out any dough for this recipe, but we will be using cinnamon to spice the pistachios. McCormick is my go to brand for spices when baking so I used McCormick Ground Cinnamon for this recipe. Flavors and aromas have the power to trigger childhood memories so one sniff of the cinnamon jar has me standing in my childhood kitchen in the 80’s. 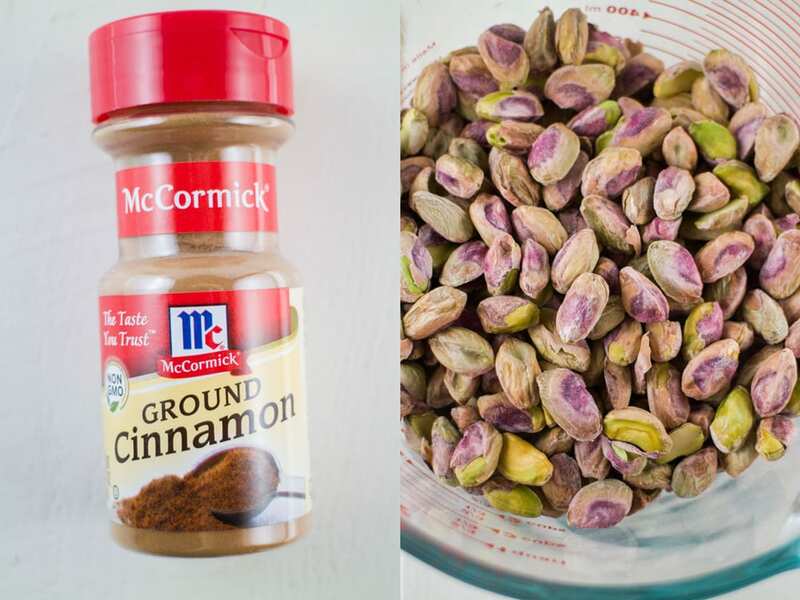 The cinnamon is a nice taste on these pistachios to go along with the sugar. Who else loves everything and anything Cinnamon Sugar? 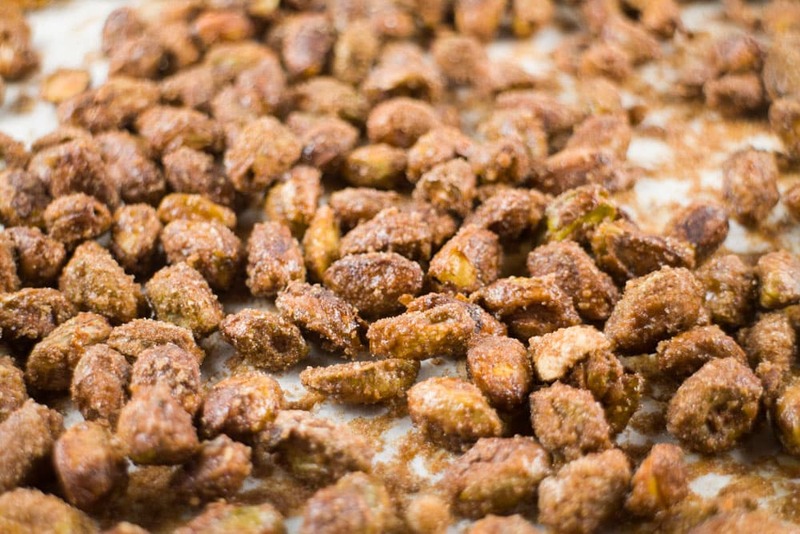 After the pistachios are coated then throw them in the oven for about 1 hour – 1 hour 30 minutes. Since we’re baking them at a low temperature they take a little longer to finish. 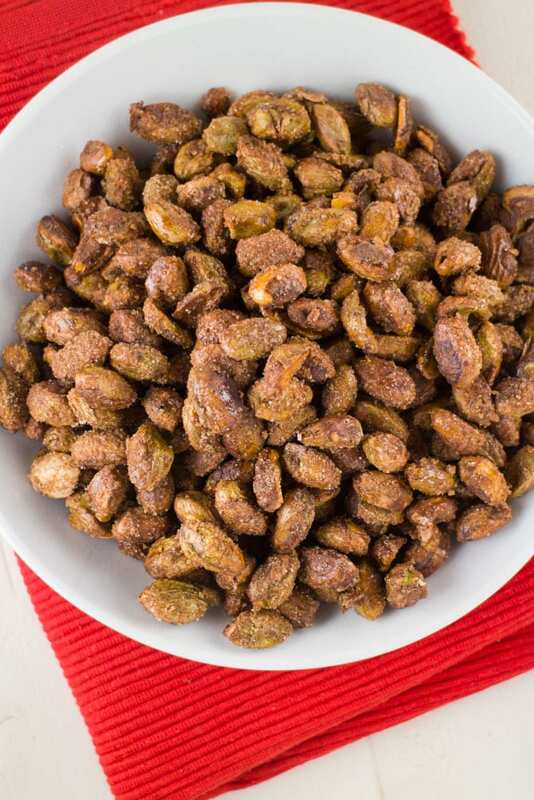 The perfect pistachio has a crunch to it, as well as flavored in the cinnamon sugar mixture. To make sure they don’t burn flip the pistachios every 20-30 minutes or so. 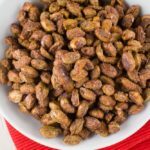 Although the recipe calls for pistachios, you could easily use almonds or walnuts if that’s your thing. Just follow the recipe as instructed but change to your nut of preference. 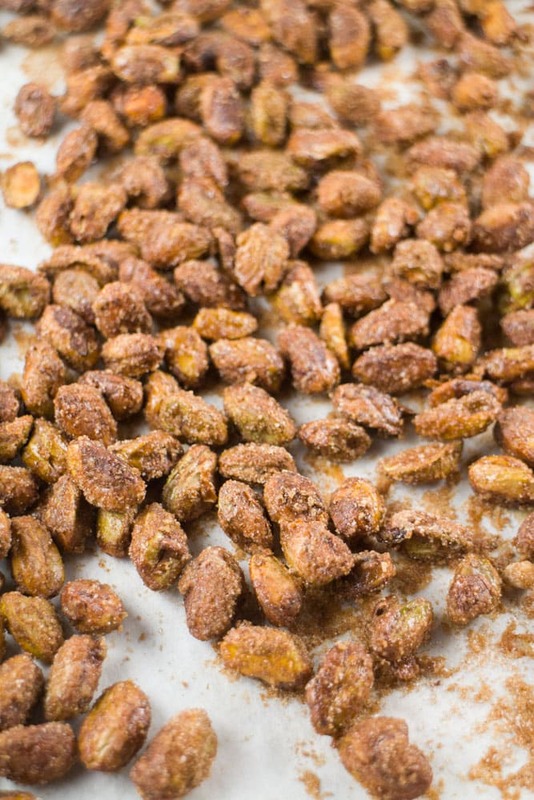 The best part of these Cinnamon Sugar Pistachios (besides the taste!) is that your home is going to be smelling like a sweet shop! Don’t be surprised when family starts coming into the kitchen asking you what’s that amazing smell! Preheat oven to 250 degrees. For easy cleanup place parchment paper on large cookie sheet. Beat the egg white and vanilla in a large bowl, beating until frothy. Add the pistachios and stir until they're all coated. Place them on cookie sheet. In a small bowl mix sugars, salt and cinnamon. Sprinkle mixture over pistachios, stirring them to coat. Make sure the pistachios are spread evenly in a single layer on cookie sheet. Bake for 1 hour - 1 hour, 30 minutes or until they are crunchy, stirring every 20 minutes. Cinnamon is definitely my favourite spice. And I am drooling over these sweet cinnamony pistachios. Pistachios are my absolute favorite! And these cinnamon sugar ones!! I love it! These would make great hostess gifts to take to the holiday parties we will be attending…thanks! 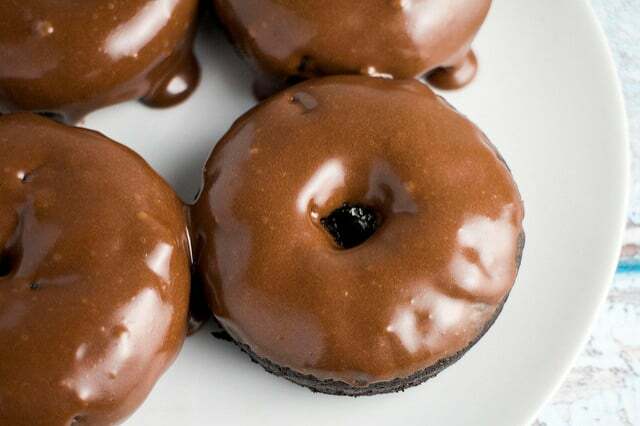 I like the easy part a lot, these look delicious. What a great idea; I could see myself getting through a whole bowl of these while watching a film! Recipes like this are crack to me. Looks so delicious! Pistachios are my fave. OH my I love to buy those on christmas markets. I really need to try out this recipe. I love them SOO much.